Quick question: what’s the dominant form of public transport in London? And an irresistible second quick question: what is wrong with this picture? We will come back to the second question, but if your answer to the first was the tube, you can be forgiven. That’s the most distinctive, most high profile part of what Transport for London provides, as well as being where most of the money goes. But the heavy work of moving people around London is done by buses: there are about twice as many bus journeys as tube journeys and there are almost 20,000 bus stops against a mere 270 underground stations. One reason for being misled into thinking that the tube is all that matters is that that is what TfL itself seems to think. 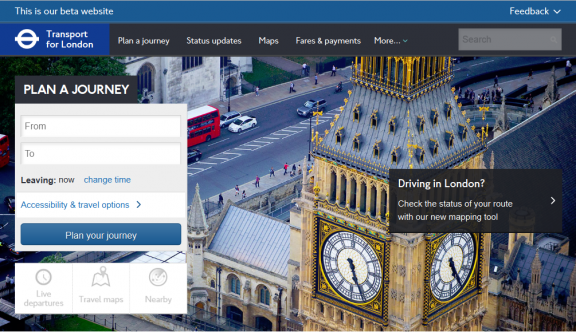 I have written before about how the ticketing system treats buses as an afterthought and the poor information design of bus arrival signs, but a fairly cursory look at the TfL website shows the depth of its assumption that the tube is what matters. 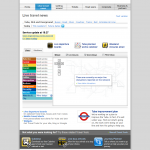 Contrary to how it might appear, this is not actually a TfL bashing post, it’s a complex information management post. The state of the underground is easy to communicate. The state of the bus network is considerably harder both to establish factually and to communicate clearly. Let’s start with live travel news. 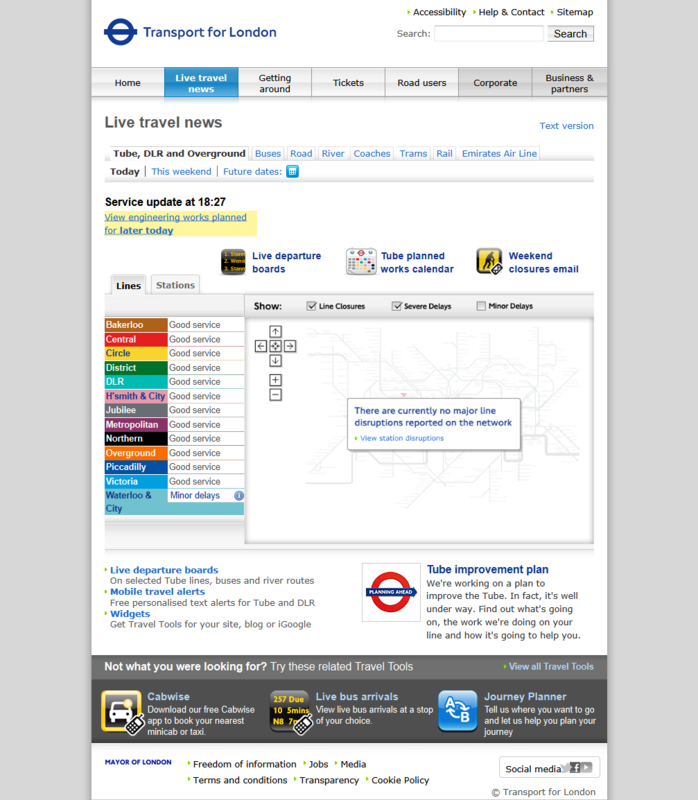 The screen is dominated by the list showing the status of each underground line and a large map of service disruptions – even when there are no disruptions on the map (click on any of the screenshots to get a fullsize version). Other forms of transport are accessible through tabs across the top – with buses getting a tab less than half the size of the tediously named Emirates Air Line. There is a live bus arrivals link at the bottom of the page, but it’s off the bottom of every screen I have ever used, and I had never noticed it before taking the screen shot. Since it doesn’t seem unreasonable to assume that TfL knows what bus routes it runs, they should presumably be able to tell which of those alternatives is correct, and be willing to share that knowledge. But perhaps I am being unfair. 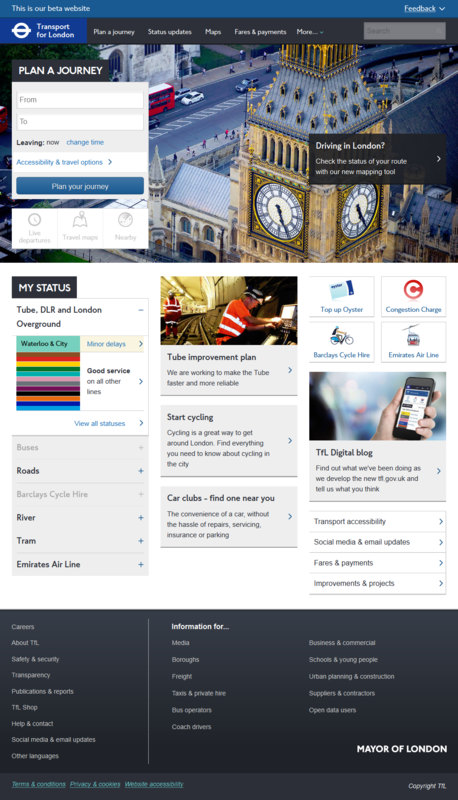 TfL is developing a new version of its website, currently in public beta, perhaps that will provide better navigation and information. The beta certainly looks much smarter and fresher, but on what is available so far, the primacy of the tube appears to be alive and well. 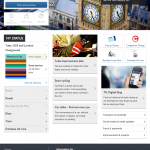 The beta home page has a smart status display which focuses on lines with problems rather than giving equally prominence to lines with no problems. 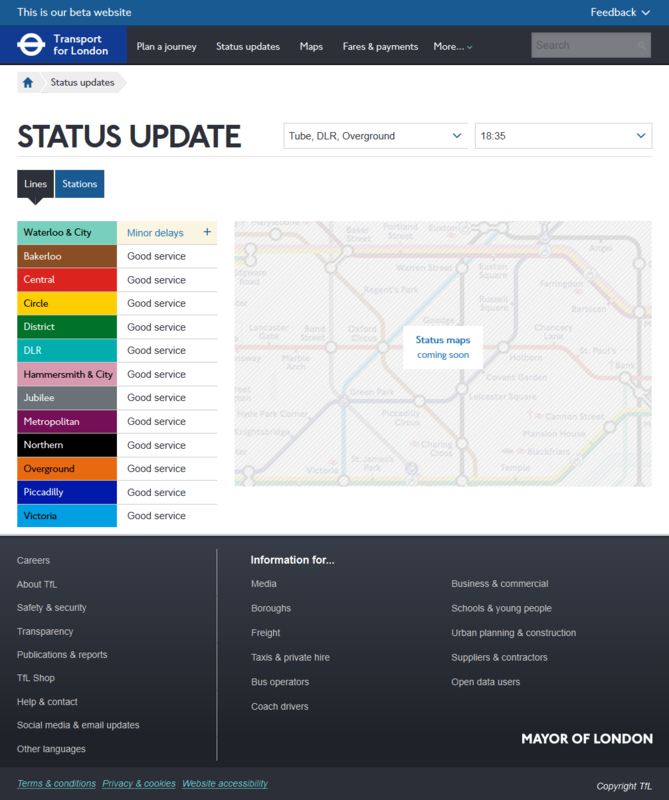 The status update page is just as dominated by the tube as the old site – even the row of tabs linking to other transport modes has been replaced with a drop down menu. And rather tellingly, both the url structure and the breadcrumb trail firmly position buses (and everything else) as subordinate to the tube as default. So much for the website. What about the information? Until December 2013, bus stopping arrangements will be changed due to major works. For southbound 2 36 185 436 N2 and N136 buses, please use stop L in Vauxhall Bridge Road. For northbound 2 16 36 52 82 and 436 buses, and westbound 148 buses please use stop H in Wilton Road or Stop Q in Grosvenor Gardens. For eastbound Route 11 211 N11 and N44 buses, use stop S in Buckingham Palace Road, to the west of Victoria Station. For northbound Route 24 buses, please use stop J in Wilton Road, and for southbound Route 24 buses, please use stop U in Vauxhall Bridge Road. For southbound Route 44 170 C1 C10 and N44 buses, please use stop R in Buckingham Palace Road, to the west of Victoria Station. For eastbound Route 148 buses, please use stop N opposite Westminster Cathedral. 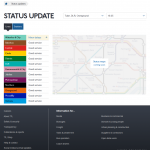 For northbound Route C2 buses, please use stop Q in Grosvenor Gardens. Route 507 will start from Victoria Station and operate via Rochester Row, towards Waterloo only, to Horseferry Road. It’s easy to carp, of course. Providing enough information to be useful but not so much as to confuse is a tricky balance to get right, and relying solely on words to do it makes it harder still. Hard is not the same as impossible though. There’s plenty of scope for improvement through better information design. But while buses are treated as a perennial afterthought, the problem may not get the focused attention it needs. 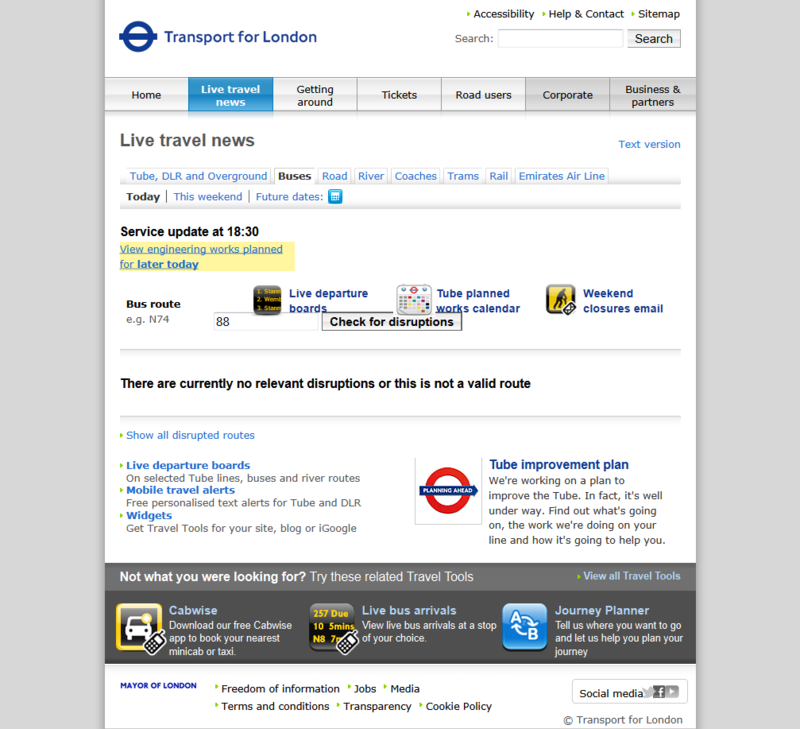 In other areas, TfL has recognised that it is better at transport management than information design. 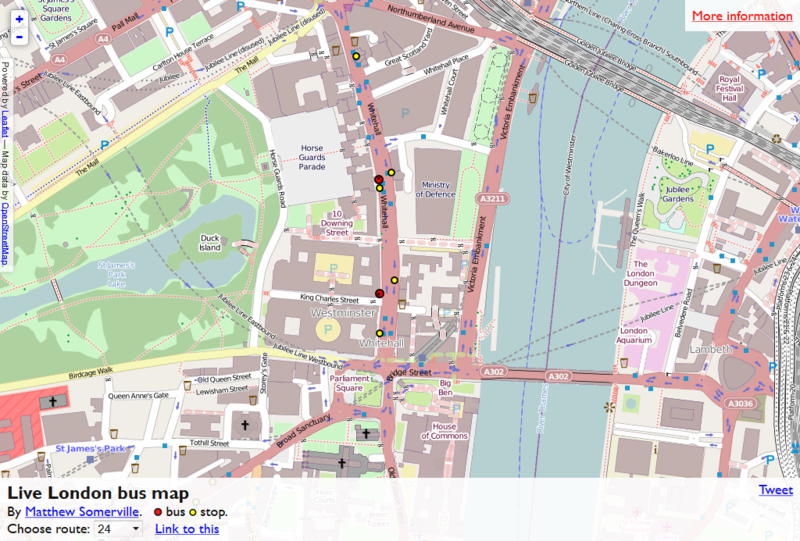 There has been an explosion of creativity since they opened their data to third party developers, but that doesn’t include the critical information about where the buses actually are. Matthew Somerville has made a splendid attempt at interpolating location from bus stop arrivals, but it’s closer to conceptual art than a practical tool. Since TfL undoubtedly does know where its buses are, it would be far better to allow access to the information than to be reduced to inferring it inaccurately. 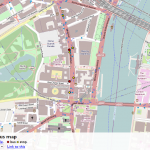 With some really smart programming, that might even allow for emergent disruption reporting, with diversions appearing on a map because that in practice is what buses were doing rather than because the disruption had been published. And so finally to the second question: what’s wrong with the picture at the top of the post? No points at all for recognising what it is a picture of. My first thought was that it was a bodged stitch up of more than one photograph, which seemed both complicated and pointless and so a bit unlikely. But then I realised that the image had been flipped – with the most obvious clue being that the traffic is on the wrong side of the road. 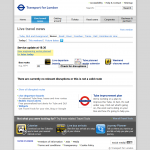 Maybe that’s a sign that TfL has ambitions to copy Sweden. Or maybe not. It may be flipped, but someone has at least gone to the trouble of altering the clockfaces so they look correct.